Warning: My simple preamble to a simple recipe ended up resembling one of those obnoxious Yelp reviews where the entitled and offended diner relates their entire sub-par experience of a given restaurant in excruciating detail. (I mean, that’s what blogs are for, right?) But do feel free to skip down to the recipe if you prefer. A recent dining experience at a highly regarded San Francisco restaurant left me considering vegetarianism. A friend from out of town kindly offered to take us, and despite the prix-fixe menu, Jay’s status as a recovering vegetarian, and my extreme squeamishness, we agreed. In anticipation, I checked the restaurant’s website, and was greeted by close-ups of various sea creatures and their dead, staring eyes. I relayed this information to Jay, and we began to have reservations (pun intended) about our dinner plan. However, the restaurant requires a 72-hour advance cancellation and we were loath to blow several hundred dollars on an un-eaten meal. So Jay pulled on his nicest pair of jeans, and we headed down to SOMA. We arrived at the restaurant a few minutes early and were pleasantly surprised by the laid-back atmosphere of bare brick walls, rustic wooden tables, and an open kitchen. Classic rock played through the speakers, and all the personnel were, well, personable. We ordered cocktails from the bar, which were served in glasses chilled with liquid nitrogen, and were shown to our table. The maitre d’ appeared and explained that one could upgrade to the “Discover” menu if one wished. This menu was even fancier, with even better wines, and a bigger price tag. We decided to go for it. The maitre d’ then asked whether there was anything we didn’t like to eat, were allergic to, or “had a thing about.” I looked at Jay, who gets grossed out by rare steak, gags at the sight of pâté, and refuses to eat raw fish in sushi restaurants. He said nothing. “Eyes,” I repeated. A blank stare. “Oh, ok,” said the maitre d’. “Anything else?” He glanced around the table. “Are truffles ok?” he asked. “Well,” the maitre d’ said, “there is sea urchin on the menu. And I will encourage you to try it. But if you don’t like it, you don’t have to eat it.” This seemed reasonable. We sat back, anticipating the gustatory delights to come, and sipped our liquid nitrogen-chilled cocktails. The first dish arrived: a scoop of black caviar atop something white and slimy, atop something red and slimy. It was served in a small, glass orb alongside a tiny, iridescent spoon. “Caviar on torn fish stomach over a gelée made from the fish’s own bones,” the server announced. Jay’s face remained a study of indifference, but I could imagine him dying a little inside. Jay won’t even eat sushi if it’s topped with tobiko roe, and he was certainly squirming at the thought of putting a whole spoonful of fish innards in his mouth. He picked up the spoon and took a bite with nary a shudder. The man is a good actor. I did the same. It was cold, salty and fishy – not really my thing, but I tried to maintain an open mind. Maybe torn fish stomach would become my new favorite food, kind of like how I used to detest brussels sprouts. Unlike Jay, I do like tobiko roe on sushi, it’s just that eating a spoonful of fish eggs is not my idea of a good time, the fact of which I had only just become aware. I imagined how caviar might be tolerable – even tasty – slathered on a piece of crusty bread, or sprinkled on a blini. But there was no bread to break up the fishiness. Just a pour of undoubtedly very fine champagne that was most likely lost on my undeveloped palate. We managed to clean our orbs, and they and the pretty spoons were cleared away. I hoped that once we’d gotten past the fish stomach, we’d get to eat something cozy, perhaps some handmade pasta with fresh truffles grated over the top, or some fancy cheeses. Maybe a vegetable or two. After all, vegetables are the new cupcakes. I read that on the internet, so it must be true. The next two cold, fishy dishes weren’t so bad. They were sashimi-like, served with slender chopsticks, and we washed them down with what I assumed was very good sake. But then a trio of tiny critters showed up. “Baby squid in a foam made from their own juices.” I pushed away some of the foam, and prodded some little black orbs on the squid. “Hey,” I said, realization dawning. “These are eyeballs! They served me eyeballs!” The men ate their squid. I choked one down, trying not to think about the eyeballs. It was slimy. The next dish came: a bowl of unidentifiable mushrooms hidden under a mushroom foam, which was exactly what I had requested not to eat. And the dish after that? Uni. As promised a dish was placed in front of Jay. It was topped with something shiny – a piece of gold leaf. I tried not to puke up my fish stomach. Just when I thought I couldn’t take anymore, a bowl of pristine asparagus was placed in front of me. I practically wept with relief. And next up, a bowl of tiny peas in broth. “First-of-the-season peas from our own garden in a broth made from their pods. We call it ‘pea love,'” the server said. And it was lovely. The rest of the meal was a dance of changing utensils, fine wines, succulent vegetables, a bit of truffle here, a touch of fois gras there. It was delicious; unfortunately, I was too full of fish stomach to enjoy it adequately, a fact that made me want to cry. Each wine was better than the next, but I was so drunk by this point, that I kept pushing my half-empty glasses over to Jay. The evening ended with the bartender pouring us shots of what tasted like a Chinese form of grappa, which I also passed over to Jay, who would later remember neither drinking the Chinese fire water, nor our cab ride home. The next day, over a non-traumatic breakfast of plain toast and tea, a hungover Jay and I speculated that perhaps the Discover menu was not intended for squeamish eaters like us, but rather for the diner who has eaten everything and wants to try something new and unusual. It really wasn’t the restaurant’s fault. All the food was expertly prepared, clean and simple and beautiful. If it hadn’t been for the first six fishy/mushroomy dishes, we both would have loved it. And someday in the distant future, when all memories of fish stomach and squid eyes have faded from my mind, I would very much like to know what their plain jane prix-fixe menu is like. What I will never understand is why they served us the things that we specifically un-requested. It felt like some weird kind of peer pressure, an expensive game of truth or dare. (Truth: I never want to eat fish stomach again.) I will also never understand why, out of fourteen courses, there was no cheese. The world is indeed a mysterious place. That whole, fishy experience made me realize that the part of sushi that I really enjoy is not the raw fish, but rather the vinegared rice, some pickled vegetables, and a bit of nori, all dunked into a mixture of wasabi and soy sauce (which isn’t traditional, but I do it anyway). The word sushi actually comes from a combination of the word su (meaning vinegar) and shi (from meshi, meaning rice) – no fish technically necessary. So, inspired by Heidi Swanson (who is vegetarian and will therefore never have to experience a meal of fish parts), I’ve been making these simple little bowls. 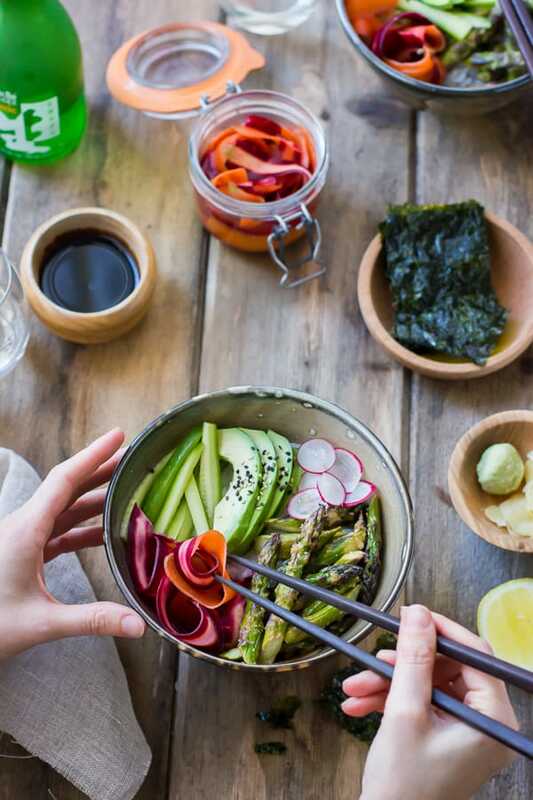 I roast asparagus in a mixture of miso, ginger, toasted sesame oil, and lemon juice, make some quick pickles from ribbons of multi-colored carrots, place them both over some vinegared sushi rice topped with radishes, avocado, cucumber, pickled ginger, and sesame, and douse the whole thing with wasabi and tamari. You can roll the components up in little sheets of crispy nori, or just eat it like a salad, with the nori crisps on the side. Or, you know, a bit of torn fish stomach, if that’s your thing. 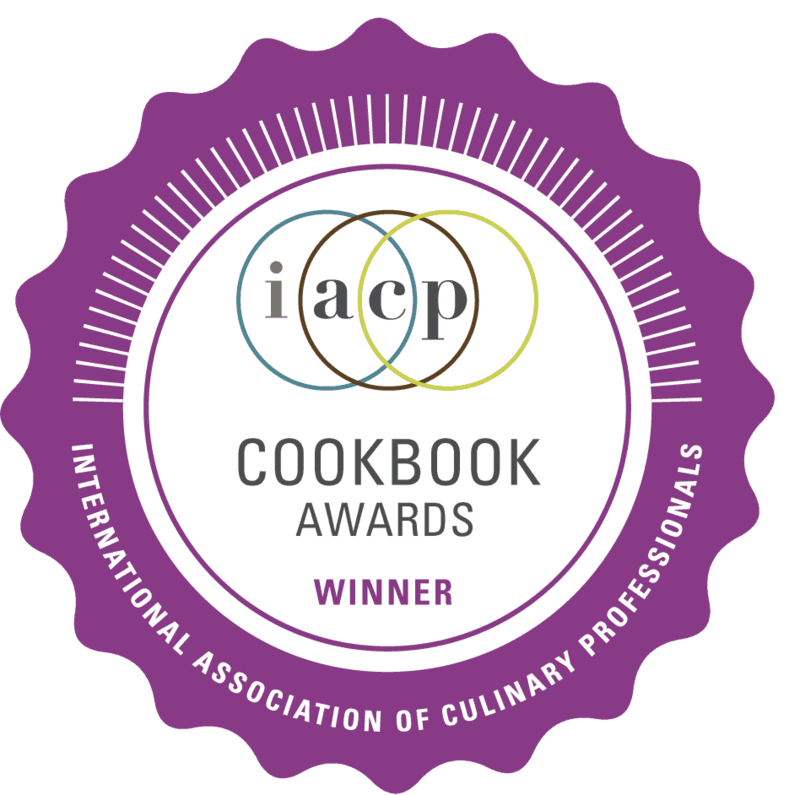 Thanks for reading! 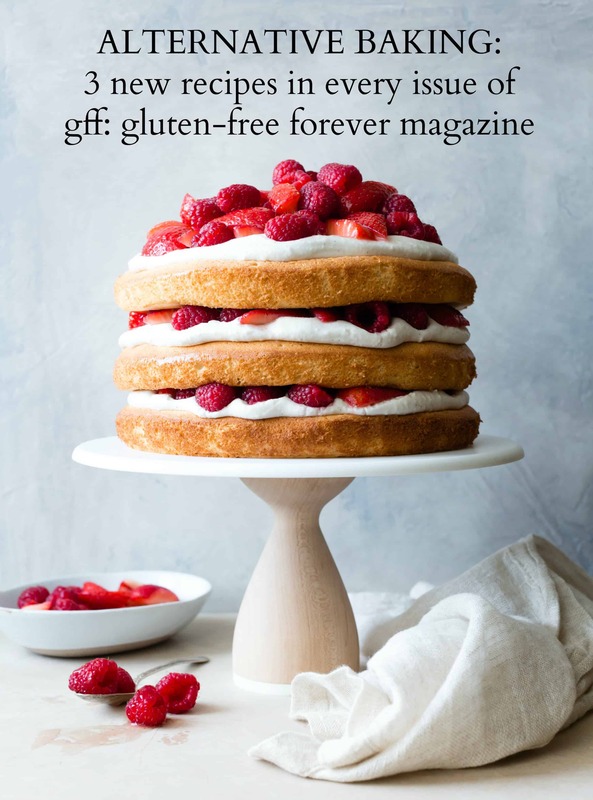 For more Bojon Gourmet in your life, follow me on Facebook, Twitter, Bloglovin’ or Pinterest, or subscribe to receive posts via email. 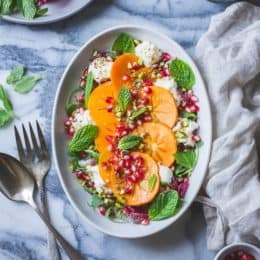 I like this dish best when served at room temperature, so I recommend letting the rice cool for 30-60 minutes before making the bowls and diving in. I used an heirloom variety called Kokuho Rose from a local California farm, which I found in bulk at our co-op. And while I like this dish best when freshly made, you can definitely keep extras in the fridge for up to a day or two. (If I had a real job, I would delight in making myself a little bento box to take to work.) 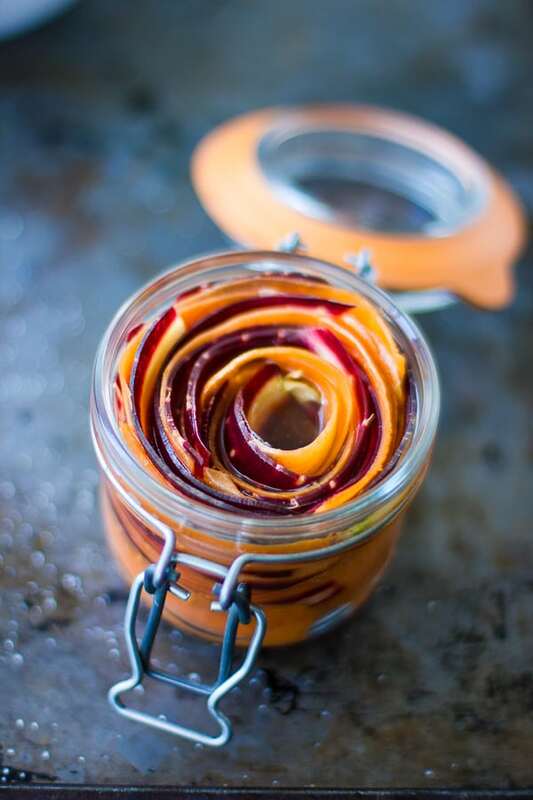 If you have extra carrot pickles left over, they’ll keep well for at least a week, though they are crispest when freshly made. I bet they’d be killer on a sandwich or burger, too. 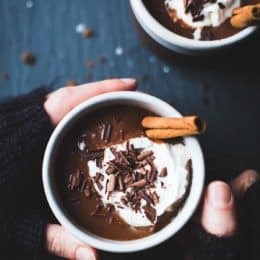 Feel free to get creative with the toppings here – I list some ideas up above. 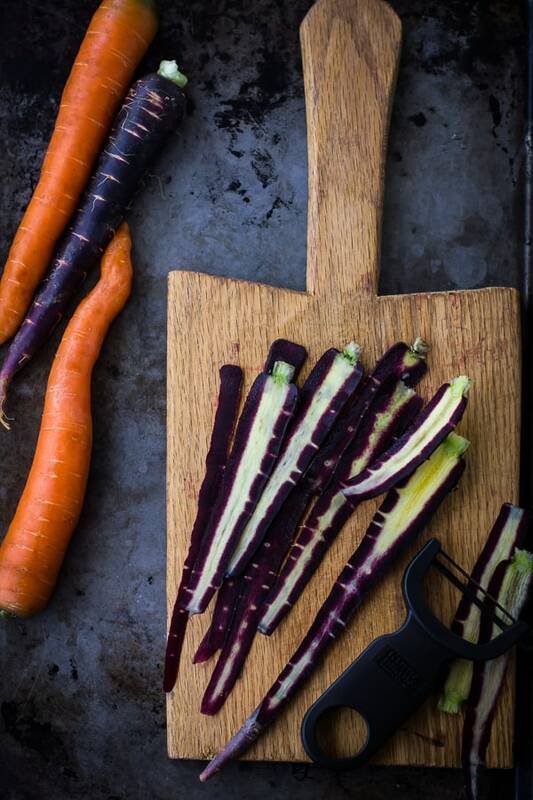 Use a vegetable peeler to peel the carrot into long, wide ribbons. Meanwhile, combine the vinegar, sugar, and salt in a mason jar or bowl, stirring to dissolve the sugar. Add the carrot, toss to coat, and let sit while you get on with the rest. Place the rice in a bowl, cover with cool water, and swish it around to release the starches. Carefully pour off the water, then repeat 2-3 more times. Drain well. 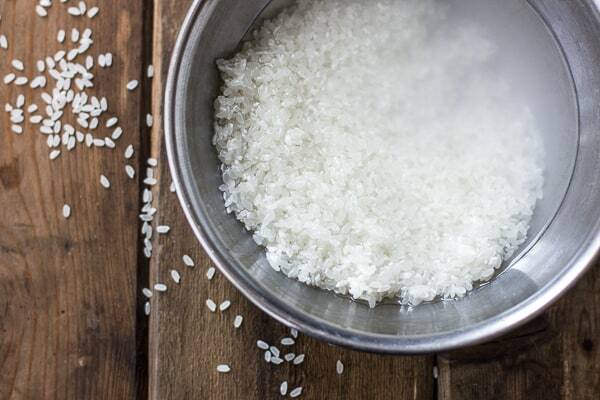 Place the rice in a small saucepan and add the 1 1/3 cups water, the sugar, and the salt. Place the pot over a medium flame and bring to a simmer. Immediately reduce the heat to low, cover the pot, and let the rice steam until the water is absorbed, 10-15 minutes. Remove from the heat and let stand 10 minutes. Test the rice – if it is too firm, sprinkle in a few tablespoons more water and repeat the steaming/standing process until the rice is tender, but still chewy. Fluff the rice with a fork, sprinkle the vinegar over the rice, and gently toss with a spoon to incorporate the vinegar. (Try to handle the rice minimally and gently to prevent if from become mushy.) Let the rice cool to warm or room temperature, 30-60 minutes. Position a rack in the center of the oven and preheat to 375ºF. 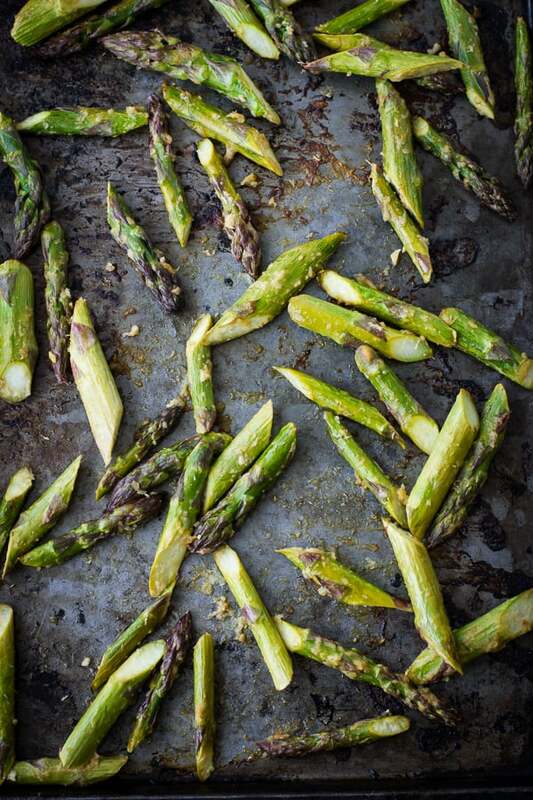 Spread the snapped and sliced asparagus on a rimmed baking sheet. 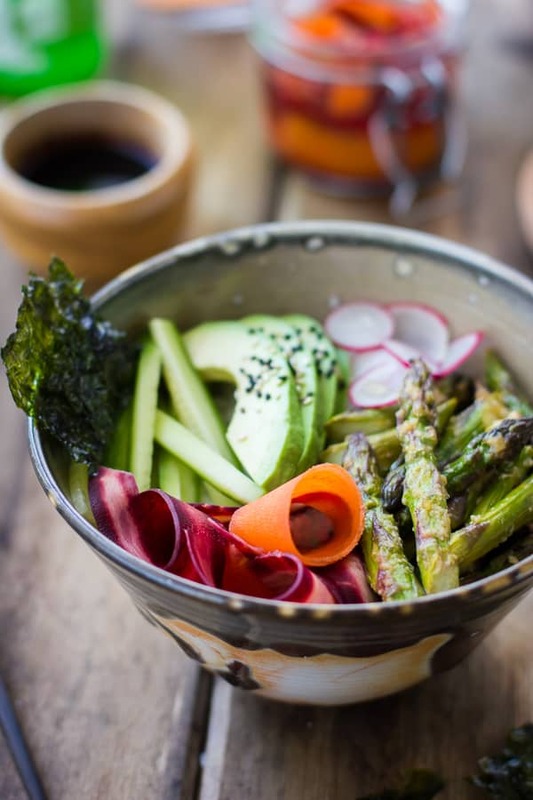 In a small bowl, stir together the miso, sesame oil, lemon juice, grated ginger, and salt. 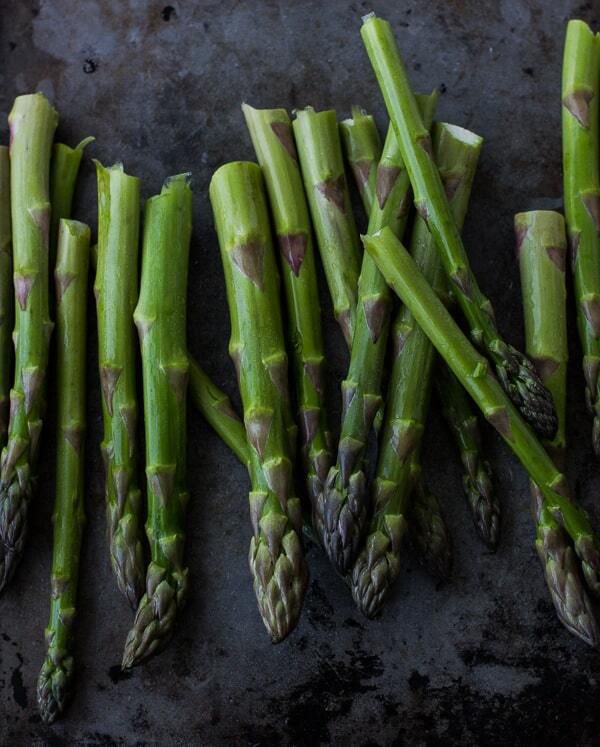 Drizzle this mixture over the asparagus, toss to coat, and roast in the oven until crisp-tender, 10-15 minutes. Remove from the oven and let cool. Divide the rice between 2 wide bowls (you may or may not want to use all of it). 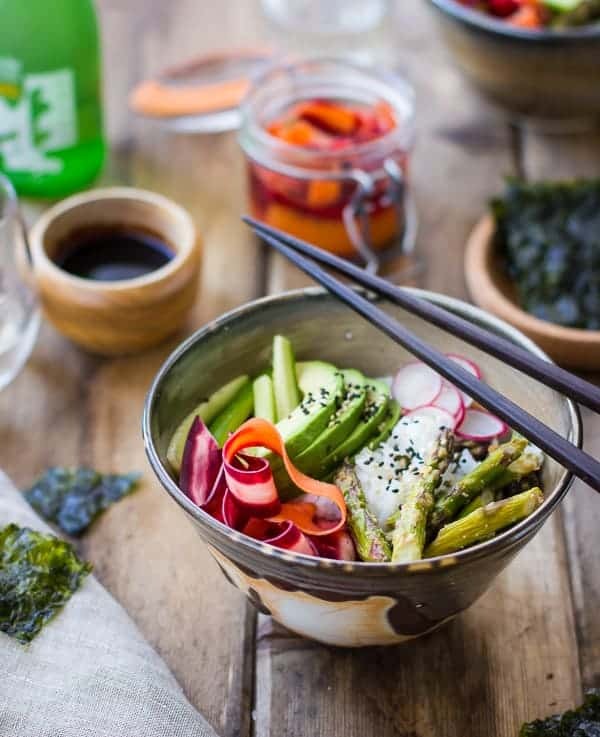 Top with the asparagus, pickled carrots, radish, cucumber, avocado, and a sprinkle of sesame seeds. 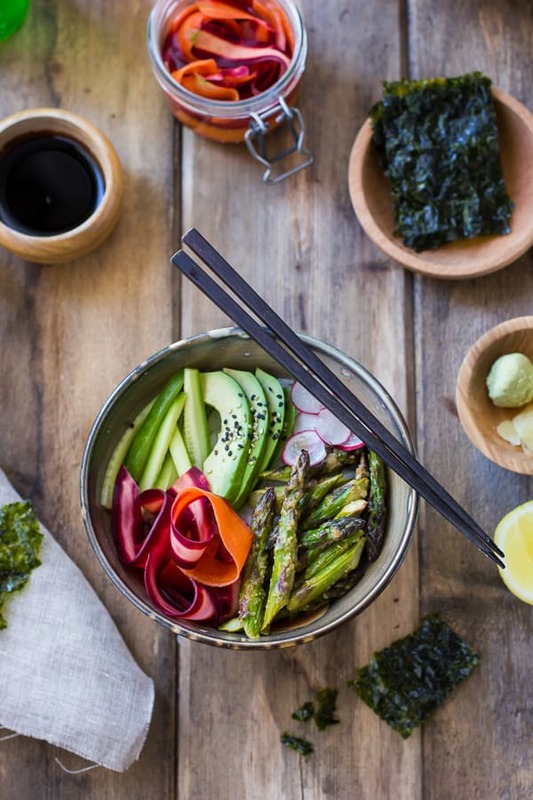 Serve the bowls with nori strips, pickled ginger, lemon wedges, wasabi, and tamari or soy sauce. 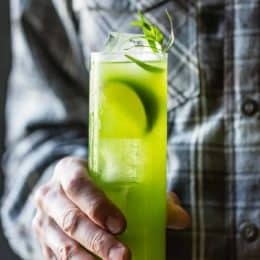 I like to mix together about a teaspoon of wasabi with a couple tablespoons of tamari, and pour it all over my bowl along with the juice from a lemon wedge or two. What a hilarious account! I'm from the camp of 'happy to eat anything once, so long as it won't kill me', whereas Jonny, my OH, won't eat anything that once lived in water. He's have been very hungry me thinks! I'm vegetarian so your experience sounds truly stomach-turning to me! The sushi, on the other hand, looks delicious – I love the look of the pickled carrots! I'm glad you understand! It's a tricky thing being squeamish omnivores. Jay and I were saying how we would have adored a vegetarian version of that meal. Thanks for the kind words, Kezia! The carrots have been so much fun to make. Gonna put the extras in a noodle salad today. I laughed out loud reading your post …. knowing that I wouldn't have survived the first course … at all! My family thinks it is hilarious that I moved to the Maritimes knowing my aversion to anything seafood. Good on you though for giving it a go. The carrots look amazing. Just cutting meat totally from my diet so looking for some yummy veg dishes. 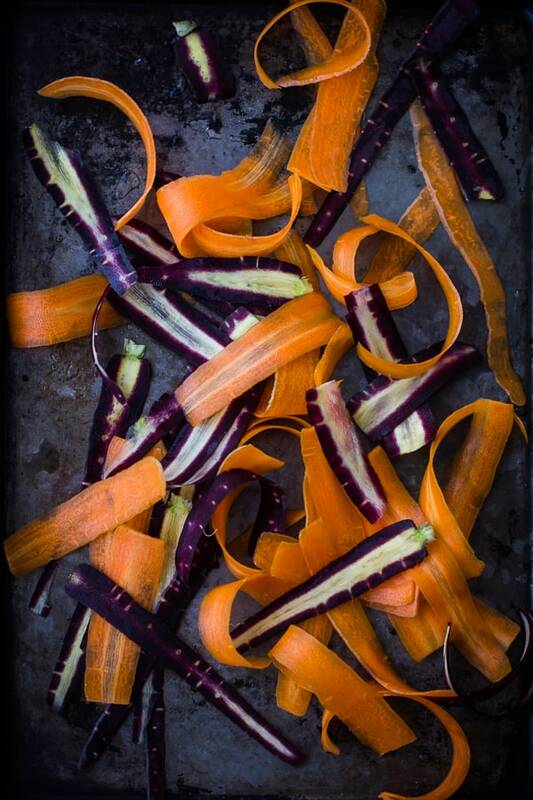 What a stunning post filled with lovely photos of these vegetables! I would love a big bowl of sushi rice right now! Oh man, I could not have survived that meal! I mean, I'm a vegetarian, but still. That is a lot of weirdo stuff for one night. The things you love about sushi are the things I love about sushi! YUM to these bowls! I know, right? I am way too empathic for freshly slaughtered abalone. I'm glad you get it, and that you like the looks of these bowls. Thanks for the sweet note, Joanne! I love the rant. It made me laugh out loud. I sooo agree that anything that is intentionally unappetizing like that is just annoying. Foam. No thank you. I would much rather have the pasta you described, or THIS gorgeous dish. Love Ameila's bowls too. They are beautiful. I am a total ceramic lover. Well, now I'm really curious where you went, but of course I am not going to ask. :) I will ask what the organic Mexican microbrew place is, though, because I MUST GO THERE. Anyway, these bowls sound really good. Such beautiful vegetables plus tangy vinegar! I love it. Well you are very tactful! The vegan Mexican place is Gracias Madre in the Mission in SF, and it is delicious. (And while you're in the Mission, you should try the okonomiyaki at Namu Gaji if you haven't already – HEAVEN.) Thanks for reading, and for the sweet note! So glad you dig the bowls. Oh come on, where did you go? Please share the name, for the benefit of the adventurours and the squeamish alike. Thanks for reading, Vicki! I'm not comfortable disclosing the name, but feel free to send me an email if the curiosity is killing you (agoodie[at]gmail[dot]com). Your write-up reminded me of an amazing deconstructionist dining experience I had at The Bazaar. I just curious if it was the same owners (it's not). Amazing disregard they showed, serving you things you specifically asked not to eat. Um, this story is my favorite. I mean, I'm really sorry you had to endure all of… that. :) These sushi bowls look like they could make up for it and then some, though. YUM. Thanks for your kind words and condolences, Stephanie! I'm glad I had the experience to satisfy my curiosity about a restaurant I thought I'd never get to try, as well as for the great writing material. And some of the food was genuinely wonderful, too. 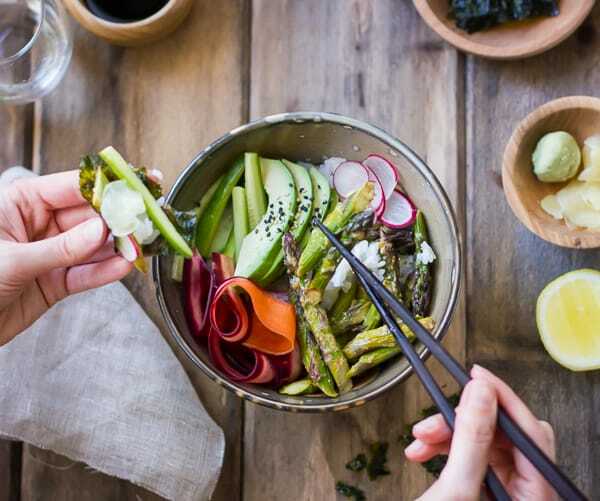 But I'll still take a veggie sushi bowl over fish guts any day. I laughed and laughed reading this, I am in the corner of a small coffee house, trying not to make to much noise and people are starting to look at me. What a great re-count of your evening, which is very memorable in any case. What a funny, albeit slightly horrifying, dining experience! I was a picky eater for many years and still have a lot of strong preferences, and yet I do like Jay and smile and swish it all down when I'm doing fancy tasting menus. Most of the time I'm pleasantly surprised, but sometimes my inner dialogue is just like, "Uh uh, not doing THAT one ever again!". Wow what a beautiful bowl of veggies! I love all of the different techniques you used as well, especially pickling the carrots. You are hilarious! I couldn't contain my curiosity, so I took to google to answer my question of what restaurant this was! Thanks to the combo of sea urchin + gold leaf + a few other terms just to keep this a bit mysterious, I found the one! Loved your account of this place that is getting so much buzz. Thanks so much for sharing, from one local to another. Aw, thanks, Kelly! Good job with the Googling, and thanks for your discretion! I can't tell you how funny I find it that sea urchin + gold leaf (+ mystery terms) turned up the right place. I guess that's a signature dish of theirs. Thanks for reading, and for the nice note. Hahahah, a thorough and well-crafted rant if I ever saw one. I'm not a squeamish eater in the least bit (oops, I had a post last month celebrating fish eyeballs…), but I think I cringed when I read "and gold. Because we can." Anyway, absolutely beautiful photos as always, and it's making me crave a good cleansing bowl of spring greens. I'm pickling some turnips right now and they look nowhere near as pretty as your carrot ribbons! I laughed out loud all the way through this post. Although I did feel sorry for the abalone and baby squid. The weirdest thing I ever ate was smoked puffin, in Iceland. Now anytime I see one of those cute little birds I feel guilty. And that recipe looks so refreshingly sane and pure, after your fish stomach experience. Well done on getting through it. Aw, thank you for laughing, Kate! Oh dear, puffins are awfully cute – I feel the same way about eating duck (which we were also served at that meal!). Thanks a million for the sweet note. That bowl is so beautiful, and I would definitely cry tears of relief if THAT showed up after torn fish stomach. Geez. I'm cringing at your experience, but it sounds like you guys were troopers! 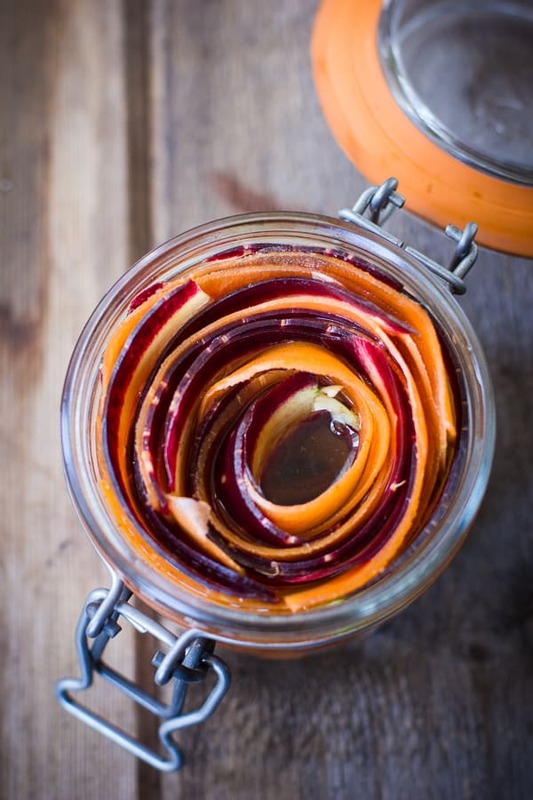 The pickled carrot looks great! Does this store well? How long can it be left for sealed in the jar? Thanks, Aimee! I updated the headnote to include carrot info. It may soften up after about a week, but it definitely stores well for at least several days in the fridge. I think canning it to make it shelf stable might make them too soft, though I haven't tried it myself. Please let me know if you play around with 'em! Alana, I think this should be nominated for one of those big deal 'best single post' awards, it's amazing, from start to finish. It is called the 'discovery menu' for a reason. They specifically asked you what you didn't want so they could serve it to you so you could try it. Unless of course the meaning of 'discovery' has changed somewhat. 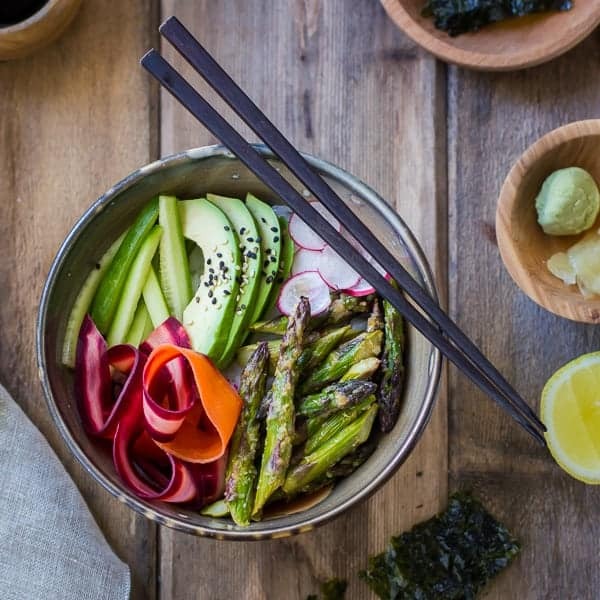 made this for dinner tonight with what i had on hand: cucumber, avocado, pickled rainbow carrots, pickled ginger, and those seaweed 'snacks' from trader joe's. i also added some pan-seared sesame-crusted mahi-mahi and served up with soy sauce and wasabi mustard. =P it was delicious! 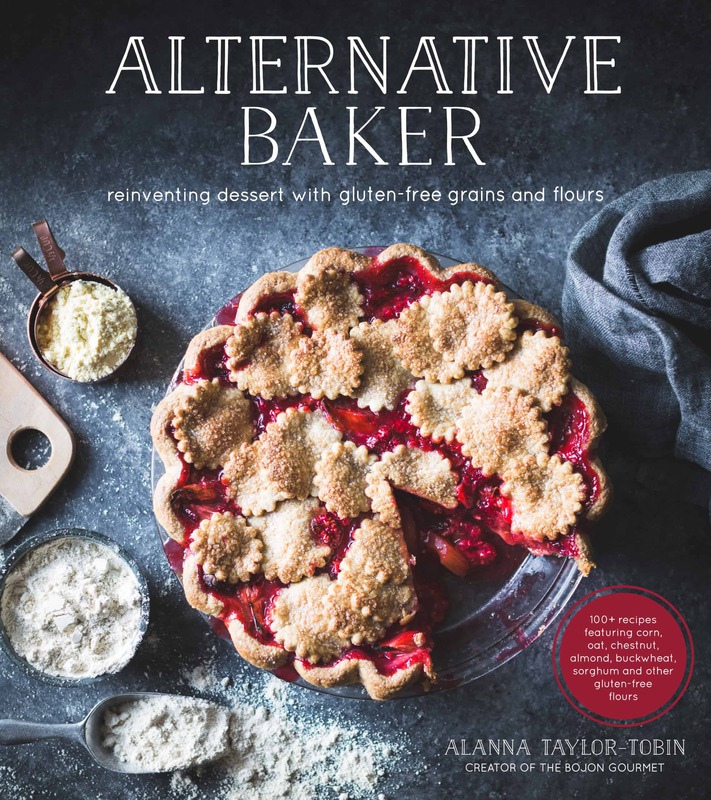 thank you for a lovely recipe that's right up my alley…inspirational, and completely tweak-able!